T. De Witt Talmage : Ocean Waves, 1896. The Earth Girdled : The World as Seen To-day. 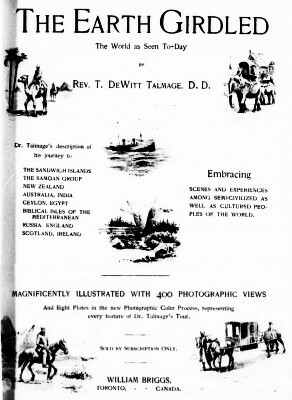 Thomas De Witt Talmage, , (1832-1902) visited Hawai'i and although he did not record surfriding, he wrote an extended comtemplation on the nature of ocean waves. times, and then oiT for Xew Zealar.d. which we ai^ain tnrst our live^. innumerable creatures of the deep. while the captive is bein.-^- dniwn in. Geoff Cater (2013) : T. De Witt Talmage : Ocean Waves, 1896.